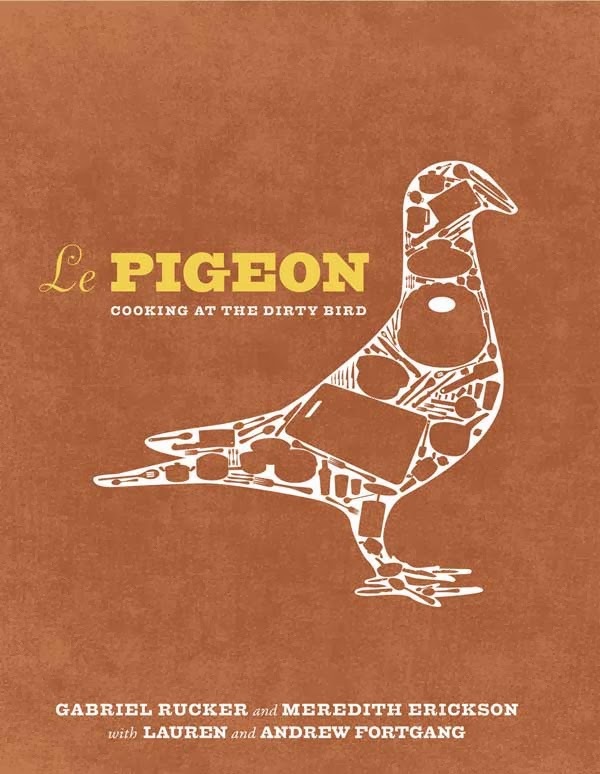 We have been waiting to get a copy of Le Pigeon: Cooking At The Dirty Bird by Gabriel Rucker. It did not disappoint. We spent so much time looking at it, that the cat became jealous and finally planted a paw on each page, successfully stopping any more perusing for the evening. Rucker will quickly point out that he grew up in Napa -- not the wealthy, winey Napa, but the working class Napa. That juxtaposition of fantastic ingredients, world-class dining, and making do with what one has clearly influenced the chef. His drink pairings apologetically lists Bud Light Lime with a "don't know it till you try it" admonition. Where else will you find a cookbook with an entire chapter on tongue. Then there is the luxe treatment of foie gras, served with Eggo waffles. A recipe that will have you saying, "Letgo my Eggo!" Rucker is also adamant that this is a restaurant cookbook. He refused to dumb-down the more complicated recipes, which he argues are not so much complicated as a bit time consuming. Stick with him and you will find a memory on the plate. Like this one. Not so much a dish as a meal. Think of it as three components: a salad, a fish protein, a vegetable and there you have dinner. 2. Remove the carrot tops, wash, and set aside. Peel the carrots and halve them lengthwise. In a sauté pan over medium heat, melt 1/2 cup (125 g) of the butter with the anchovies and the grated zest from two of the lemons. Add the carrots and season with kosher salt. Transfer to a baking sheet, spread in a single layer, and roast in the oven until slightly softened but still a little crunchy, about 12 minutes. Remove from oven and toss with the juice of one lemon. 3. In a shallow saute pan over medium heat, combine the carrot juice, the crushed garlic, bay leaf, and orange zest. Cook until reduced by three quarters, about 10 minutes. Add the remaining 3 cups (750 g) butter and stir until melted, then reduce the heat to very low and keep warm. 4. Next we’re going to buzz our carrot top pesto. Simply combine the carrot tops, the whole clove garlic, the olive oil, the juice of one lemon, and a pinch of kosher salt in a blender and blend until you have a fine pesto consistency. Set aside. 5.To make the fennel salad, in a bowl combine the fennel, olive oil, chives, and anchovies and season to taste with salt and pepper. Set aside. 6. Now, to poach the fish. Heat the carrot butter to 130°F (55°C) over low heat. Season the halibut with kosher salt and add the fish to the butter. Keeping the butter at 130°F (55°C), poach the halibut until you can press down on the fish with a fork and don’t feel a pop (that pop is connective tissue that hasn’t yet broken down), about 10 minutes. Using a slotted spatula, transfer the halibut to a plate lined with paper towels. Squeeze the juice of the third lemon over the fish and sprinkle with Maldon salt. 7. To serve, place roasted carrots in the center of four shallow bowls and top each with a halibut fillet. Top each halibut fillet with the fennel salad. Drizzle the pesto around the fish, spoon a tablespoon of carrot butter over each plate, and serve. 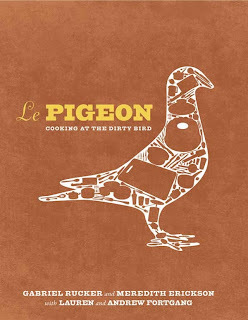 Face it, there are some things in the cookbook you will never cook and there are some you will want to cook. There a glorious photos and practical drawings. There are recipes and an ode to the Plymouth Valiant and it will make your cat jealous. What more do you want?